New Aladdin Trailer Finally Gives Us the Genie | Nerd Much? With the release of Disney’s live-action Aladdin treatment coming in just over three months, it’s concerning that we’ve yet to see any shots of Will Smith as the CGI version of the infamous blue Genie. But thanks to a new Aladdin trailer, we were given just that. Much of the new Aladdin trailer, which Disney dubs a “special look”, is footage that we’ve seen in previously released footage. It opens very similarly to the first Aladdin trailer. Iago is seen flying over the dark desert landscape, and then we see men on camels making their way to the Cave of Wonders. Things shift a bit from here, as we see Marwan Kenzari’ Jafar ordering Aladdin (Mena Massoud) to bring him the lamp from inside. During the shot you can see Iago upon Jafar’s shoulder, and Abu on Aladdin’s. Later on we also witness our first glimpse of Rajah accompanying Princess Jasmine down the palace steps. We cut to a quick shot of the streets of Agrabah, now day, with a colorful parade flowing down the street. There are dancers and elephants and hundreds of spectators. Things jump around from there, before returning to the Cave of Wonders to catch Aladdin rubbing the infamous lamp. A blue smoke emerges, growing larger and larger as the entity within flows out. Then, finally, the new Aladdin trailer gives us a full blown look at Will Smith’s CGI blue genie. And to be honest, it’s not great. Something just looks off about the character’s look. 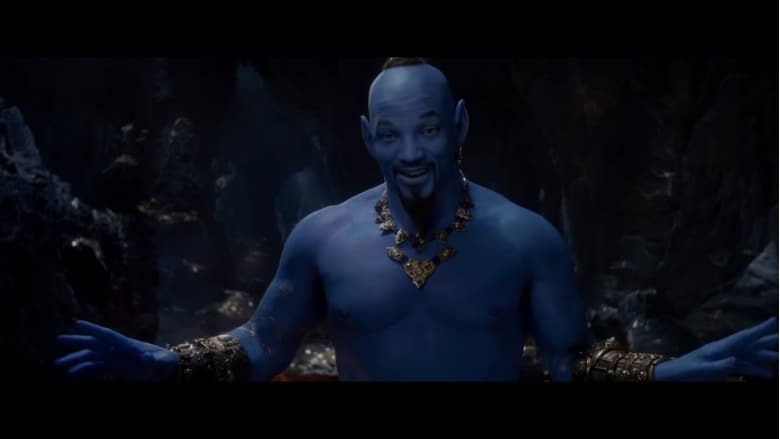 Almost as if the CGI Genie’s body just had Will Smith’s face simply pasted onto it. Smith’s character won’t be CGI all the time though. A good portion of his portrayal will be in a disguised human form, like we saw in the stills released last month. And with a little more than three months left until release, hopefully Disney’s animation teams can iron out whatever is causing this iconic character’s to just be – off. Guy Ritchie’s live-action Aladdin hits theaters on May 24th.